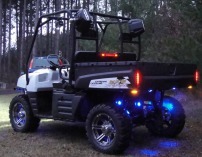 Check out this custom Polaris Ranger XP. It has custom paint and accessories to make it unique, and several unique Brite Lites HID lites, LED Lites, and interior lighting to make this a unique machine with lights everywhere. The front has 3 sets of HID lights, a full LED turn single kit, interior LED lights and dome light, Accent lights under the vehicle and in the wheel wells, and a LED light bar in the back to add extra safety. One of a kind rig.